Can I Wirelessly Connect My PC to My HDTV? Ernest Valdez, Jr. asked how he could wirelessly send a video signal from his computer to his HDTV. There are number of ways to do this, although they may not provide what you want. First of all, a great many televisions today have WiFi built in, which allows you to wirelessly connect them to your home network, and thus to your computer. So do many new Blu-ray players--and they're a great deal cheaper than HDTVs. But is WiFi really your best option? Depending on your home's geography, WiFi may not be reliable enough for quality streaming video. If it isn't, consider using Ethernet. All of the TVs and Blu-ray players that support WiFi, and many that don't, have Ethernet. 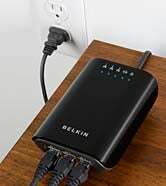 If stringing an Ethernet cable from your router to your TV isn't practical, HomePlug devices--which use your home's electric grid to transmit data--can easily give you an Ethernet connection to any room in your home. You probably already know that,--however they're connected--networked HDTVs and Blu-ray players can play Internet streaming video. Virtually all of them offer Netflix. Many have YouTube, Pandora, and at least one pay-per-view service. Newer ones are including Hulu Plus. Most of them can also play videos and music, and display photos, off of any computer on the network. The computer has to be running DLNA server software, but that's not difficult. Windows Media Player--which comes bundled with Windows--is such a server. But these features don't make the HDTV or Blu-ray player as versatile as a computer. They can't play all of the streaming video services that your browser can handle, nor do they support every media file format that you might find on your PC. That's why many people like to plug their computer into their HDTV. Of course, that's not a wireless solution. Or is it? I tested two wireless PC-to-TV devices for this article. Atlona's AT-AiR3 and Cables Unlimited's Wireless USB to HDMI & VGA Adapter with Audio appeared to be the same product in different packaging, although only the Atlona's supported 1080p. 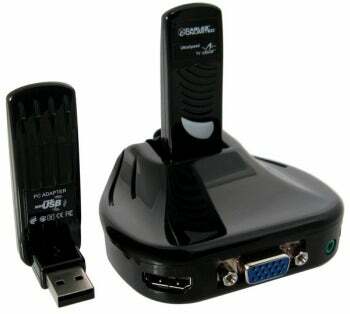 In both cases, you plug one USB device into your PC, and plug another one into your HDTV via not-included HDMI or VGA cables. Both had the same problem: a software installation that makes major changes to Windows' Registry and adds an autoloader. Also, their ranges were limited; you basically had to be in the same room as the TV. But each allowed me to watch PC content on the television while my laptop was at my fingertips. Their image quality was equivalent to using the PC's HDMI port. This story, "Can I Wirelessly Connect My PC to My HDTV?" was originally published by PCWorld.